Summer vacation is fast approaching…it’s almost time to pack away the school text books. While we often think of summer as being a carefree time of the year, the reality is summer can be quite stressful. As a work at home mom, summer vacation means I have to find ways to entertain my kids while I get my work done. Their “entertainment” comes at a price. In fact, our household isn’t the only household taking on additional spending in the summer months. According to a recent TD Canada survey, 55% of Canadian parents with children under the age of 18 will take on additional costs during the summer; 71% of them spend up to $999 per child. To be honest, I’m not really surprised. When you add up the day trips, visits to the ice cream parlour, weeks at camp and family vacation time summer can quickly add up. So, how can a typical family cut costs during the summer months? With the help of Linda MacKay (Senior Vice President, Retail Savings and Investing) and Shirley Malloy (Associate Vice President, Acquisition & Sales Management) from TD Canada Trust, I’ve put together some simple tricks and tips that can help keep costs under control – while everyone still has a fun summer vacation. DIY Popsicles – Skip the trip to the ice cream parlour in favour of enjoying your own custom flavoured popsicles. The kids will love coming up with creative flavor combinations – make room for strawberry lemonade and strawberry raspberry pops. Start Saving Early – Planning a family road trip? Start saving early for the additional expense. There are plenty of online tools that can help you calculate how much you need to save each week (hyperlink to TD website). Have your kids start a spare change savings jar – everyone’s spare change goes right in the jar to be put toward the family vacation. Explore A New Neighbourhood – There are so many great neighbourhoods in our city, yet we never have a chance to explore them. Grab a map of your city and plan a trip to an area you have never visited before. Hop on public transit and turn a day in your city into an adventure. Benefits of Being an Early Bird – Many camps offer discounted early bird registration rates. Do your research early and use the early bird rates to cut costs. Early summer is also a great time to be thinking of fall programs. Check with local dance studios, art studios, etc and see if there are early bird rates for fall programs. Head to the Library – As you know we love the library. Our first stop on summer vacation is our local library. Join in the free, summertime fun with the TD Summer Reading program at participating Toronto Public Library branches. Take in a puppet show, make a craft, get the kids reading and connecting with your local branch with this incredible program. Do a Little Research – Often times we simply go with what we already know. When it comes to cutting expenses this summer, take the time to do a little research and look for the best deals on summer programs and excursions. Most cities and municipalities run excellent programs at affordable prices. Shopping around will save you money and give your kids a chance to experience something new. Check Your Points – Before heading out on your summer road trip, check your credit card reward program benefits. Many credit card reward programs include savings on flights, hotels, or redeem your points for items on your family vacation shopping list. Picnic Fun with Friends – Let’s face it, kids just want to play. Arrange to meet up with a group of friends at a local park for a picnic. Spend the day playing in the sand box, cooling down in a splash pad or hiking a ravine. Pack a picnic basket filled with treats that all the kids can enjoy. Head Back in Time – Plan a visit to one of the City of Toronto historic sites. Journey back in time and see how the first settlers and founding families of Toronto lived. There are ongoing programs running all summer long. A trip to a historic site is an inexpensive day trip for families. Keep Those Receipts – Did you know that some summer expenses are actually tax deductible? Keep your receipts and apply them to the annual childcare expense and child fitness tax credit portion of your income tax form. Check with a tax professional or Revenue Canada to see if your child’s summer program qualifies. Whatever you decide to do this summer keep in mind that children won’t remember how much money you did or did not spend – they will remember the time they spent with you. With a little planning it is possible to a memorable summer vacation without breaking the bank. 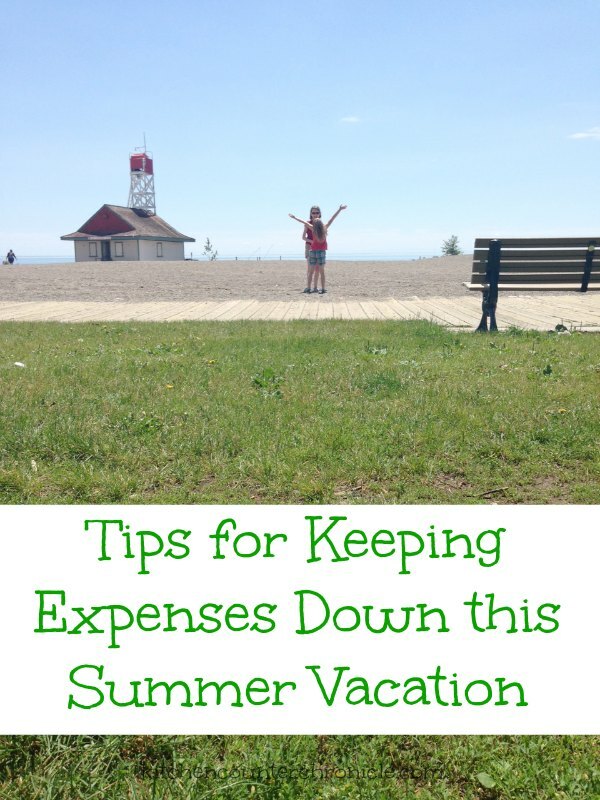 Share your tips…how do you keep expenses under control in the summertime? This post was sponsored by TD Canada, however the images and opinions are my own. Follow Jen at KitchenCounterChronicle’s board Summertime Fun on Pinterest. Great tips! Summertime is more expensive and it can be hard to keep costs down. Excellent tips! We use most of these! Ooooh, great tips. Just in time for Summer too! Love these suggestions! We’re always looking for inexpensive ways to have fun.